More than 60% of Greeks rejected an outdated and expired rescue package offered to Greece by its European partners. Greek prime minister Alexis Tsipras’ strategy for an “all in” at the negotiation table worked, at least for now. His government can now claim that Greeks are tired of austerity and need growth. While all reasonable observes would agree that it is growth that Greece needs, the country is at the brink. However, also the Eurozone is facing its worst crisis since it started to exist in 1999. 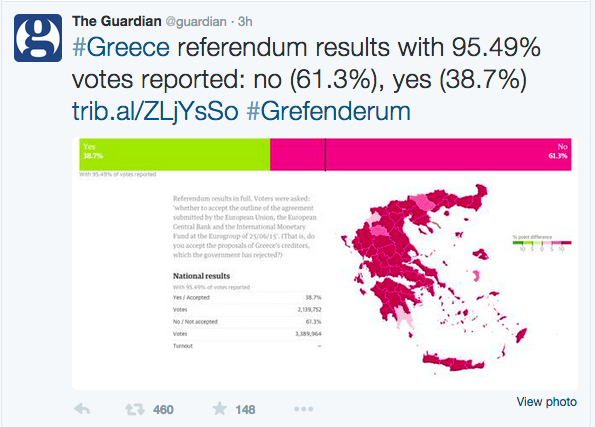 The results of the referendum are in, the “no” camp clearly won. The clear results of the referendum come as a surprise. Until the very last day before the vote, all polls showed a totally even result between the “yes” and “no” camp. It has been a tough week for Tsipras’ government with restrictions on ATM withdrawals, shuttered banks and looming shortages of imported food and medicine. As Greeks have started to stockpile food and fuel, empty shelves as well as crowded gas stations were seen during the week. However, another wave of populism against austerity measures and the claim to restore dignity for Greece with a “fair” deal, the leftist populist government convinced their people to be against the rescue deal. The “yes” voters should be worried. They had many supportive messages from Brussels that also showed a way forward, like the speech of European Commission president Jean Claude Juncker. There were also many TV ads sponsored by key sectors of the Greek economy, including the tourism sector and the industry association. While during the week it appeared that the “yes” vote would gain momentum, this camp clearly failed to get their message across. After all, it was the gut feeling of Greeks to decide about a package in ten days, without any substantial discussion but only slogans. Protests of the “no” voters ahead of the referendum. According to opinion polls, the “no” voters believe that by rejecting the rescue package, Greece has a stronger negotiation position in Brussels. Indeed, it seems likely that Tsipras and his finance minister Yanis Varoufakis will appear even more self-confident in Brussels during the negotiations to come. Instead of looking for a compromise, they very much likely feel to be in a position to demand more and thereby taking the risk tearing apart the last connections with its European partners. While the “no” voters are celebrating at Athens’ central square, very soon no celebrations will be seen anymore. Too much damage was done in the negotiations with the European partners during the last weeks and months, and the referendum just added to that. Instead of finding a compromise, Tsipras called for a referendum over a rescue deal, mostly due to internal pressures in his party that would have not supported that step. This was an extraordinary step that was not seen before. The prime minister claimed that this would be a democratic decision, ignoring that he is leading a country that is a representative democracy. It is this populist leadership style of Tsipras that led to Greece’s continuous isolation in Europe. By now, Greece stands on its own, not having a single ally in the Eurozone. However, the Syriza-led government has no alternative: their attempts to look for money elsewhere, mainly in Russia and China, has not worked. The negotiation strategy of Varoufakis, a highly intelligent economist but without practical governance experience before becoming finance minister, has not worked as of yet. He did not present any concrete numbers for weeks during the negotiations, instead putting all the blame on European partners. That was an attitude not seen before in Brussels, thus his fellow colleagues have been highly irritated of his style, leading to personal animosities. When he finally offered a €7.9bn package to his European partners in end of June 2015, no compromise was reached. Why? Most likely because Varoufakis continuously has broken the most basic rule in Brussels by looking for confrontation instead of compromise. That is dramatically in counter to the spirit of European integration that is inherently based on a culture of ongoing compromise. And by accusing the creditors of “terrorism” on Friday, an absolute new low point had been reached. One of the contradictions after the referendum remains that the big majority of Greeks is fearful of a so-called Grexit, Greece leaving the Euro and thus the EU. Some 75% want to remain within the Eurozone. The majority of Greeks feels to be in the heart of Europe. And yet, the austerity course of the past five years has hardened the view of many Greeks about the EU. It is the anger about the socio-economic decline and the deterioration of even basic services that moves many Greeks toward populism on the right (the neo-nazist Golden Dawn) and left (Syriza) that promise easy answers in a highly complicated and complex situation. Tsipras, as so many times before, used incorrect historic comparisons during the short referendum campaign. He asked Greeks to be against the proposal, voting “oxi” (Greek for no), comparing the “no” vote with the Greek dictator Ioannis Metaxas against fascist Italy in 1940. The images are clear, as the Troika is on the streets of Athens mostly perceived through the person of Angela Merkel, who indeed seems to be the decisive factor about the course of negotiations with Greece. However, the implication of Tsipras’ comparison is that Germany with its Nazi past acts today like during World War II, Greece would need to resist the fascist threat just another time. Building up trust between partners is certainly not promoted through the rhetoric of this Greek government. Tsipras and his government celebrated the “no” vote as a choice for a more democratic Europe. He is quoted as saying that “today, democracy is defeating fear … I am very optimistic.” At the same time, Tsipras demands to get a better deal for Greece. Obviously, he seems to imply that the 18 other Eurozone members will agree on a deal without making a “democratic” referendum in their respective country, because time is running out for Greece. 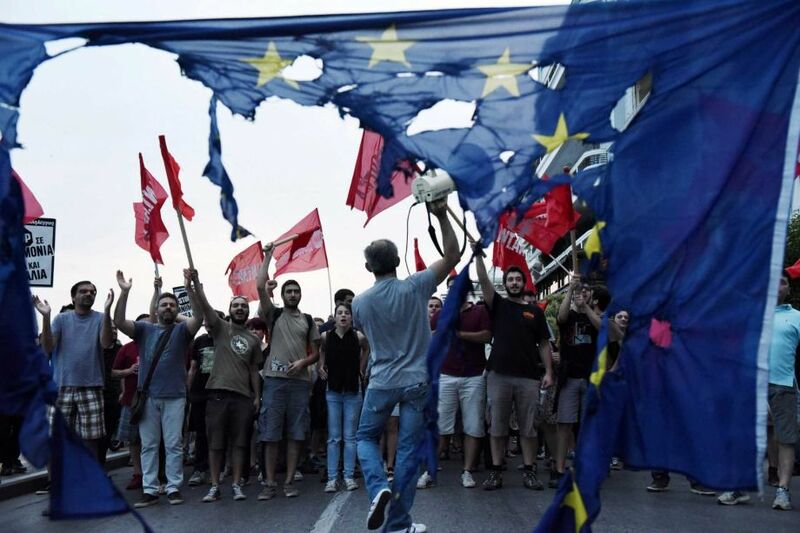 Thus, the warning of the “yes” camp seems valid that a rejection of the proposal could imply an end of solidarity of its European partners, Greece being forced to leave the Eurozone (although it has to do so voluntarily). Negotiations itself will continue already on Monday. There is still time to negotiate a new deal, the 20 July is often mentioned as a deadline. This is due to a €3.5bn payment loan that Greece needs to cover. It seems not very much likely that Greece will get the money as they failed to pay the International Monetary Fund (IMF) this week with a €1.6bn payment. As a matter of fact, Greece defaulted this week as the first “developed” Western country over a loan in the history of the IMF. And yet, Greece can continue to negotiate because the European partners have not given up yet to bailout Greece. For a good reason, because the consequences of a Grexit for the Eurozone and the project of European integration would be horrific. 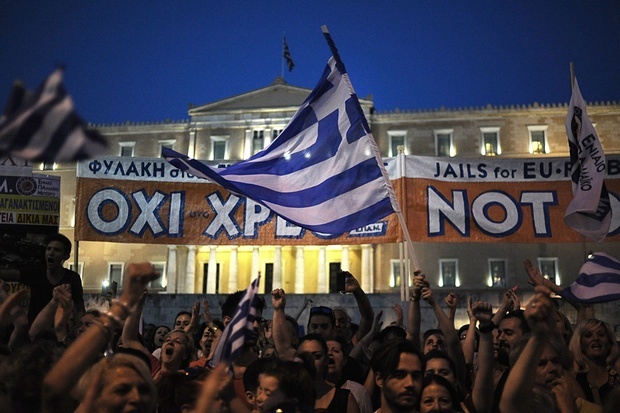 A Grexit would not only mean Greece leaving the Eurozone but automatically the EU. This failure to resolve the differences with Greece will impact the course of the EU for decades to come. Not least, because a Grexit would mean a Greek default and heavy losses for Eurozone members. In the end, also Germany and other hardliners will need to agree to some form of debt restructure for Greece as even the IMF admitted this week, namely a debt relief, in their own best interest, if not even more money (and trust in the euro) should be lost. A deal reached at last? When no deal is reached, Greek’s Central Bank will not have the money anymore to fill up the equity of Greek’s banks that are hard hit by the outflow of deposits by Greek citizens in the last weeks. The Greek government would be forced to either take the money of Greek citizens or leave the euro. Both options have been described as a no-go by the Greek government. Yet, the likelihood of a deal after this referendum seems to be on a very low level due to low level of trusts of Eurozone members in this Greek government. Europe’s policy makers know about the seriousness of the crisis and will continue negotiating until the very last minute with Greece. Many good suggestions have been put on a table, this piece seems to be particularly good to show the way forward. The exercise to find an agreement with a government that seems not have the experience to negotiate successfully nor seems to be willing to offer a viable compromise, seems to be, to say the least, a challenge that even the biggest optimists hardly can see anymore. Those that will suffer would be ordinary Greeks. Ironically, it were the same ordinary Greeks that decided with their gut feeling to make the situation even more difficult. The article has been revised and updated on 4 July 2015, 10:05pm.